Durable and nimble, Miele canister vacuums are still the top-performers for this update, but they're pricey, too. Kenmore and Eureka make more affordable models that perform almost as well. While there are fewer canister vacuum models available than other types, if one fits your home and lifestyle, you'll find a recommendation here. For the best combination of value and features, experts recommend the Miele Compact C2 Electro+ PowerLine. It's one model in a line of Miele vacuums that are tops in testing for their performance on carpet, bare floors and in dealing with pet hair. The sealed body and HEPA filter make it a great choice for allergy sufferers, too. This particular Miele canister comes with a powered brush head for carpets, a bare floor tool, and upholstery and crevice tools. The Kenmore 81614 earns several recommendations from experts as a good choice for either bare floors or carpet -- especially for those who need to wrangle pet hair on any surface. HEPA filtration is standard, too, which is great for allergy sufferers. 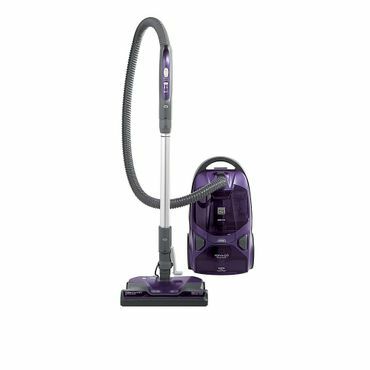 In testing, the 81614 proves itself to be a powerful, versatile vacuum, performing nearly as well as canister vacs costing far more. It's also reported as easy to use, with a wide, 14-inch cleaning path and a retractable 28 foot cord. 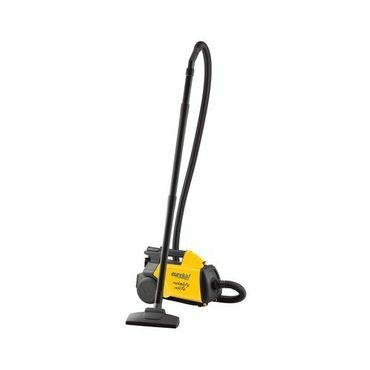 The Eureka 3670G Mighty Mite is a top contender among low-priced canister vacuums, especially for users who have primarily hard floors. It's not the best choice for cleaning carpets as it doesn't have a powered brushroll, but it does perform exceptionally well at removing pet hair from hard surfaces and furniture. It's also versatile, converting to a blower to clean dust from keyboards or garage corners. At just 9 pounds, it's very easy to carry around. Canister vacuums are not quite as common in most households as upright vacuums, which we cover in their own report, but they can be a great fit for people with certain cleaning needs. Canister vacs are a particularly good choice for those who have a combination of hardwood floors and rugs or low-pile carpet, as well as those who need to reach under beds or furniture, vacuum stairs or above-the-floor items such as upholstery or drapes. The Miele line of canister vacuums is always at the top of every expert test and "best of" list that we evaluate when we prepare this report, and there's good reasons for that. Miele vacuums are built to stand the test of time: they're sturdy, durable and solid, without feeling stiff or unwieldly. They also have excellent filtration. However, they tend to be pricey, and you'll want to be sure before you buy one that there is an authorized dealer within a reasonable distance so you can easily take it in for repair if necessary. Taking price and performance into account, we find that the best combination of those two is found in the Miele Compact C2 Electro+ PowerLine (Est. $600) canister vacuum. It's the upgrade pick to an upright vacuum at Wirecutter. Testers there are fans of the entire Miele line, but make a very good case for sticking with the smaller Miele C2. As they point out, it's the least expensive Miele canister that includes a powered brush head, which makes it a superior performer on carpet, even high pile carpet, an area where most canisters struggle. The specific "Electro Brush" that the Miele Compact C2 Electro+ includes is the SEB 228, which has a height adjustment for different carpet piles. The included parquet brush, the Parquet-3, is a gentle option if you worry about a vacuum cleaner scratching your high-end floors. Wirecutter says it performs well, too, saying, "The bare floor tool sucked up more debris from hardwood floors faster than all the other vacuums we've tested, and its soft bristles are gentler on sensitive surfaces than an upright vacuum's wheels and spinning brush roll." If you're an allergy sufferer the Miele Compact C2 Electro+ PowerLine is a particularly good choice. HEPA filtration is standard, and the sealed body means fewer emissions overall. A number of owners remark on how cleanly this vacuum runs, and say it has made a notable difference in their allergy issues -- and quite a few say they don't see "motes" flying around in the sun as they vacuum like they have with other types and models of vacuum cleaners. 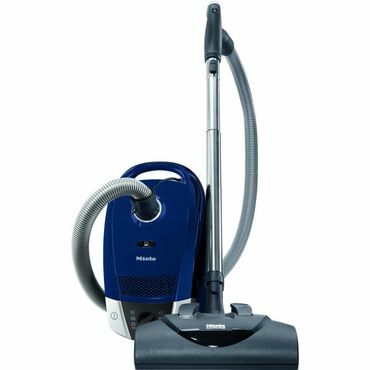 As with all Miele vacuums, the Compact C2 Electro+ PowerLine is extremely sturdy and durable, and yet is nimble and easy to maneuver around obstacles, under beds and other furniture, and above your head to vacuum draperies and other higher-up surfaces. It has a 16 foot cord, but a total operating radius of 33 feet with the hose and telescoping wand included in the reach factor. The Electro+ weighs 12.9 pounds and stores compactly with all accessories onboard. One popular feature is the retractable cord that's operated with a foot switch. The Miele Compact C2 Electro+ PowerLine is a bagging canister vacuum that uses Miele 10123210 AirClean Bags (Est. $16 for 4 bags). That's about a year's supply for most. They're reported as very easy to change out, much easier than the bags on most bagged vacuum cleaners, but they're on the small side so you might have to change them more frequently than a higher-capacity bag if you vacuum a lot. If you'd like to upgrade to a larger capacity bagged vacuum while still retaining many of the positive features of the Compact C2, we recommend taking a look at the Miele Complete C3 Cat & Dog. It offers both powerful performance and enough included attachments to make it a versatile cleaning tool. While we like the Cat & Dog because of its versatility and focus on pet hair, any canister vacuum in Miele's Complete C3 series can be expected to perform comparably, the only differences are in the accessory packages. The C3 Cat & Dog was a former top pick at Wirecutter, and they're still fans of the entire C3 series too. A C3 series vacuum, the Miele Complete C3 Marin (Est. $1,100) is the top pick at Consumer Reports, earning scores of Very Good for carpet, Excellent for bare floors. Editors there also test the Miele Complete C3 Alize, but don't elevate it to Recommended status due to its only achieving a score of Good on carpet (the Alize does not include a powered brush head, however, which would explain its lower score in that metric). The Miele Complete C3 Kona (Est. $900) is the top pick at Reviewed, with the caveat that, while this is the one they tested, any of the C3 series would be a good choice. The Miele C3 Cat & Dog has the same powered SEB 228 carpet tool as the Compact C2 Electro+ as well as a mini handheld turbo brush that makes it particularly well-suited for cleaning pet hair off of furniture and upholstery. There's also an upgraded parquet tool, the SBB 300-3, which is more maneuverable than the one on the Compact C2, but is still designed to be gentle on hardwood. Other attachments that come standard with the Cat & Dog are a crevice tool, upholstery tool and dusting brush. Other accessories are available as optional purchases and you can purchase any accessory for any of the vacuums in this series. The Cat & Dog, with its focus on controlling odors and pet hair, includes a standard, carbon-based AirClean filter; a HEPA filter, the Miele HEPA SF-HA 50 (Est. $25) is available as an optional purchase. However, the HEPA filter, which is widely reported as an excellent choice for controlling emissions, is included with the Complete C3 Marin. The Marin also has a couple of extra convenience features, including a "parking" system that shuts off the vacuum when you take a break, then turns it back on when you resume vacuuming. The Marin does not include the turbo brush, however; that's why we recommend the somewhat cheaper Cat & Dog for most households, and the Marin for households where allergies are an issue. Of course, as noted above, you could buy the Marin and then buy the turbo brush separately, it's sold as the Miele STB 101 (Est. $65). Regardless of which Miele you choose, ease of use compared to upright vacuums, owners say, is superb. The foot controls on the Miele C2 and C3 series vacuums make it easy to adjust suction and height without stooping. These vacuums are extremely well-balanced, and, although the Cat & Dog weighs 23 pounds, it feels lighter, owners say, thanks to its ergonomic design. Many users who upgraded to this vacuum (or any vacuum in the Miele line) after years of using "cheapies" wonder why they waited so long, saying the premium price is worth it for premium build and performance. A few say they don't think it seems to perform as much better as its high price indicates, but most are very pleased -- especially those with pets, stairs or lots of hard floors. Miele offers one of the best warranties in the business: seven years on the casing and motor, which includes parts and labor, one-year on accessories and hoses. Most people can't afford to reach towards the $1,000 mark for a full-sized canister vacuum. And that's okay because there are plenty of canister vacuums that cost much less and do just as well in testing. The tradeoffs generally come in maneuverability and ease of use, so, unless those latter two attributes are your top concern, or you just happen to have the cash, there are some terrific canister vacuums that won't set your budget back quite so much. Kenmore has long been a well-respected name in canister vacuums, and the Kenmore 81614 (Est. $300) is one that does well in expert testing. At Consumer Reports, the 81614 is named a Best Buy and earns Excellent scores for its performance on bare floors and pet hair, Very good for carpet, which are the same scores as the top-rated Miele Marin. The Kenmore also gets an Excellent score for emissions, thanks to its HEPA filtration, which is standard on the 81614. What brings the 81614's overall score down there is ratings of just Good for tool airflow and noise. Jonathan Chan at Reviewed also tests the Kenmore 81614 and finds a lot to like. It aced his tests on bare floors, carpet and throw rugs using a variety of debris, and really excelled when it came to pet hair pickup. Like most canister vacuums, it's not the best performer on carpet, although it's not bad. Ultimately, Chan gives the 81614 a score of 7.6, with both Editors' Choice and Best of Year awards. Where it falters in Chan's tests in usability. The top-heavy wand tends to fall over easily and the plastic clip that's supposed to keep it standing breaks easily. He also says it feels heavy, although at 23 pounds it's the same weight as the better-balanced Cat & Dog. Kenmore has recently started selling some products through Amazon, rather than just through Sears, and there we saw good owner satisfaction. Most say it works great on any type of surface and is very easy to use and maneuver. We did see a few quibbles: that the bag is finicky to change out or that it's top-heavy, but, in general, users are very satisfied. At Sears, however, the only other retail outlet for the Kenmore 81614, owner reviewers are less complimentary. However we've found that to be the case with reviews of Kenmore appliances at Sears. In our experience, people tend to be more likely to take the time to leave a poor review rather than a good one. A deep dive into the feedback there shows a lot of user satisfaction, with some complaints about maneuverability and usability -- the same issues Chan had -- with what seems like overly downgraded scores for those complaints. One legitimate issue, though, is that everyone seems to agree that the Kenmore 81614 is loud; although whether that should lead to a one-star rating from an otherwise satisfied customer is debatable. The Kenmore 81614 includes a small powered pet tool, a crevice tool, dusting brush, and a bare floor tool; all accessories store on-board. It also features a long, 28-foot, retractable cord, a 10.5-foot tool reach and a wide, 14-inch cleaning path. With good cleaning power and that full range of accessories, the 81614 is a very good value. Another good choice in this category, although it carries a higher price tag, is the Kenmore Elite 81714 (Est. $400). Consumer Reports gives it Excellent scores for pet hair and bare floor performance, and Very Good scores for carpet cleaning and airflow. Allergy sufferers may appreciate that it is also one of the top-scorers there when it comes to emissions, earning an Excellent rating. That's bolstered by the vacuum's two levels of filtration, including HEPA media technology for removing more allergens from the exhaust. On the down side, it gets lower scores for both noise and handling. While some call this an exceptional canister vacuum for its price, owner opinions are split on the Kenmore 81714. In a switch from the owner reviews for the 81614, we see higher satisfaction at Sears, lower grades at Amazon. Durability is one area of concern. We spotted some reports of breakdowns within the first few months, but many other owners that say this is an extraordinarily well-built vacuum cleaner that lasts for years. It's not the lightest canister vacuum and, at 22 pounds, it's reported as too heavy and bulky for some users -- the wand is said to be especially heavy and awkward. But it does have a 10-foot attachment reach and a variety of included accessories for versatility, such as a crevice tool, floor brush, dusting brush, and a motorized hand tool for cleaning up more efficiently after pets. All attachments store on the vacuum's body. It has a wide, 14-inch cleaning path and the cord is 26 feet long. Most of the top canister vacuums we saw are priced at $300 to $1,000 or more, but we found some strong reviews for budget canister vacuums priced at $100 or less. While these models generally cannot handle carpets very well, they should be adequate if you vacuum infrequently or have light cleaning jobs, particularly if you only need to vacuum hard floors. Among these, we saw the most positive comments for the Eureka 3670G Mighty Mite (Est. $75), which is why it's our top pick among cheap canister vacuums. This incredibly lightweight (less than 9 pounds) bag-equipped vacuum manages to pack a surprising amount of power in a small package, according to expert and owner reviewers. Chan at Reviewed gives the Mighty Mite a lot of praise, saying that on short-pile carpets and hardwood floors, "it provided performance as good as vacuums that cost five times as much." Owners are very complimentary too, saying this is a terrific, basic, no-nonsense vacuum for hard floors. A number say they keep in in their beach homes for quick sand pickups. Although many users wish it were retractable, the 3670G's 20-foot-long cord is also described as a bonus. Most agree that as long as your expectations aren't unrealistic, you'll be satisfied with the performance of the Eureka Might Mite's performance. For a few dollars more, the Eureka Mighty Mite Pet Lover 3684F (Est. $90) is a step up from the regular Mighty Mite with features that make it better suited for pet-hair pickup as well as a HEPA filter for cleaner vacuum emissions. Both the Mighty Mite and the Pet Lover Mighty Mite are reported as noisy, but owners don't seem to mind. In fact, some point out that noise is expected of any vacuum, particularly one that boasts so much power for such a compact unit. Both Mighty Mite vacuums can use special Filter Bags (Est. $10 for 9 bags) designed for odor elimination. Both models have 12 amps of power and weigh less than 9 pounds. The Pet Lover does have a wider cleaning path by an inch; it's 11 inches compared to the regular Mighty Mite's 10 inches. Both have blower ports for blowing out sawdust, leaves or other dirt from a garage or workshop. The Pet Lover Mighty Mite includes a special attachment for removing pet hair, but owners have mixed opinions on how effective it really is, and some say the vacuum actually works better without it. In that case, the less expensive Mighty Mite is a better buy if you aren't concerned about HEPA filtration. A canister vacuum isn't for everyone; they're less common here in America than Europe and Canada, possibly because they're not quite as good for carpet, in general, and we Americans love our carpet. If you think an upright might be a better choice for your home, we cover upright vacuums in their own report. And if you're ready to ditch the big vacuums altogether, our stick vacuums report not only names a few stick vacs that can replace your full-sized vacuum, but also a few good, inexpensive choices for quick touch ups -- and many convert to a handheld as well. However, if you just need a handheld vacuum for your car or dust busting spot messes, we cover those too. For heavy duty clean ups in a garage or workshop, check out our report on wet dry vacuum. Of course, the hot vacuums of the moment are robot vacuums, and we admit we love ours, but we're also crazy about our iRobot Braava 380t (Est. $300) mopping robot. It's a hard-working lady who has saved us many hours of slaving away over a wet mop. Check out how the whole story of how we chose it in this blog post. There are a few solid expert reviews of canister vacuums that involve testing, most notably at Consumer Reports (which requires a subscription), Wirecutter, Reviewed and Top Ten Reviews. Even better, we found a lot of consensus across these sites as to which canister vacuums were the best performers, which helped us a lot in narrowing down our picks. And, of course, real-world feedback from actual owners and users of canister vacuums is invaluable in gauging a canister vac's performance and convenience in everyday, real-world use, as well as for the long term. Most helpful were the reviews we found at sites such as Amazon, Walmart, Sears, Target and Bed Bath & Beyond.